Return the phone call or show up for the interview. If that sounds obvious to you, let me share that the single biggest barrier I've seen to experts getting mentioned in news coverage is their own failure to show up. That might mean failing to show up for interviews to which they've agreed, or their failure to merely return a phone call inquiring about an interview. Instead of blowing off that phone message, call back--even if it's to say you are not available, but would be willing to talk another time. Ask about the deadline, right away: This is the easiest way to let the reporter know you take her inquiry seriously. It's how her world is organized. Besides, asking about the deadline first helps you prioritize how much time you have to prepare. Let the reporter get a word in edgewise: The entire point of a media interview is to get information from you--but that doesn't mean you have to take a deep breath and dump all your information at once, in the first answer. (Scientists and engineers, I'm looking at you--and that goes twice for starting at the beginning of time to explain the entire field to the reporter when all he asked was a question from today's world.) Work on a short answer that summarizes a few aspects of your field or topic, then stop. If the reporter wants to know more, trust me, he'll ask (if you let him.). This goes double for live interviews, folks. A deep breath in between each of your statements also helps provide the reporter with a shoehorn to wedge in another question, so pause plenty. Show up prepared: Reporters' time is limited, and they move fast. Take the time to anticipate what the reporter might ask, how you might answer, how it sounds, what needs a clearer explanation, what's too long or too short, and what the news context is around your topic this week. Have the reports, data, visuals or other materials you might want to share at your fingertips. I'd rather see you spend even just 10 minutes gathering your thoughts than spend those 10 minutes in the interview fumbling around for an answer--that's a waste of your time and the reporter's time. Answer, or at least address, the questions: Despite what you've been coached elsewhere, you need to answer the reporter's questions--otherwise, what are you doing the interview for? If you can't answer right now, address that issue forthrightly. That might be as simple as saying, "We're not ready to answer that definitively, and here are the things that will have to happen before we can..." It's the reporter's job to press the question; it's your job to answer or explain why you can't answer. I see far too many interviews in which the reporter feels compelled to mention that the interviewee blithely ignored, roared past, or never got around to answering the question. They notice, and they get to mention that they notice that you're dodging. Seeing that in a news story where you're the source doesn't help establish you as a source worth calling back. Ask for the reporter's understanding of what you said before you hang up: Rather than ask to see the story before it airs or hits the web, or complain later, why not end the interview by asking for a recap of what you said to make sure you're both on the same page? Reporters appreciate getting the facts right....before the story is done. The interview is your opportunity to make sure the facts are straight. Be available for follow-up questions: Your willingness to answer follow-up questions, along with your availability to do so after hours if need be, are an "extra mile" that will set you apart from many sources. But don't count on a follow-up call. Make sure you get the main facts into the interview, then stand by for anything else that may come after the reporter has talked to others. Offer other sources unconnected to you: That might mean sources of data, like reports the journalist hasn't seen, or other experts in your field who can offer another perspective. Be generous with information in this way, and you'll reap the dividends. 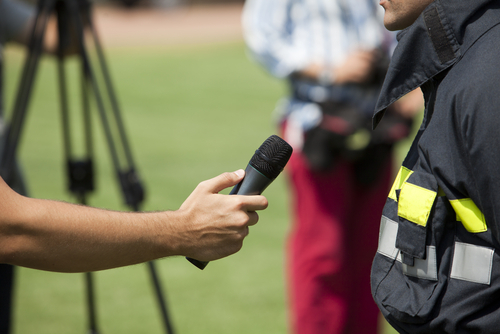 Do you or your team need training in media interview smarts? Email me at info[at]dontgetcaught[dot]biz.